Five more channels added to Sky Go mobile TV service | What Hi-Fi? 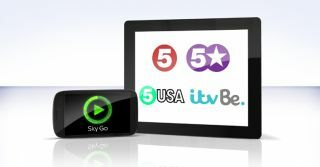 A trio of Channel 5 channels are among five new additions to the Sky Go mobile TV service line-up, which now lets Sky subscribers access up to 70 live channels via their smartphones or tablets while on the move. In addition to Channel 5, 5* and 5 USA, ITVBe and British Eurosport 2 are now available on Sky Go. That you means you needn't miss content as diverse as The Dog Rescuers, British Superbikes and Neighbours. Luke Bradley-Jones, brand director of TV products at Sky, said: "It’s great news for our 5.6 million Sky Go customers who can now get even more shows to watch including TOWIE and Big Brother." Channel 5 digital media director James Tatam added: "We’re delighted Sky Go customers will be able to enjoy the incredible line up of programmes we’ve put together this autumn across Channel 5, 5* and 5 USA."